Houston’s poetry scene continues to grow and that is definitely something to be proud of. 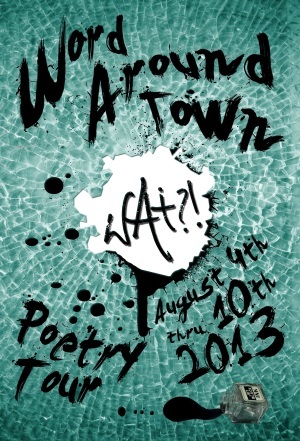 This Sunday, the 2013 Word Around Town, often called WAT? !, kicks off. The week of poetry readings held at different venues throughout the city runs from August 4 – 10th. And Inprint is excited to host it on Monday, August 5th, when WAT?! comes to Inprint House. We asked one of the lead organizers of WAT? !, Stephen Gros, to talk to us about how the series got started and what’s in store for this coming week. Inprint: How did WAT?! get started? Stephen: WAT?! kicked off it’s inaugural tour in the summer of 2006 with 12 poets. It was an incredible achievement and was completely unprecedented in the city of Houston, whose open mic poetry community was not particularly cohesive or inclusive. At the time poets were loyal to their local open mic and most poets didn’t go to the other open mics around town. Zelene Pineda’s ground-breaking idea for an inner city tour that would highlight Houston’s diverse and talented poets while introducing them to new venues and audiences was a concept desperately needed. She brought the concept to renowned DJ and lyricist Joe B and myself. At the time, I was an open mic host and co-founder of Panhandler Publishing, and with our combined knowledge and connections we put together the first tour. Essentially we strung together the major open mics of the time, Taft Street Coffee, Helios, Gs & Zs, Mocha Life and others. To noone’s surprise the tour was an unmitigated success that continues to grow and mature with every year. Inprint: How do you choose your featured poets? Stephen: We choose poets from our previous lineups that have served for three or more years on the tour. The veteran feature is a way to highlight the poets who have made a name for themselves with the tour while creating opportunities for new poets to join the line-up. Since the veteran feature is separate from the main line-up, it means there are more open spots available each year. These features are people who are really leaders of the performing poet community and the featured position, sponsored this year in part by a grant from Poets & Writers, is our way of honoring their artistry and support. Inprint: How do you choose your performance venues? Stephen: It is important to continually introduce new venues to the tour that support art and culture. The venues where WAT poets perform should reflect the talent and creativity shown by Houston’s poets. That is why the organizers pay as much attention to the venues as we do to the poets. It has become a tradition to spotlight those forums that have served as magnets for poetry, the arts and the community. This year, one of the new venues is Inprint, featured on Monday August 5th. Inprint has been a staunch supporter of all things literary in Houston and has brought many incredible nationally celebrated authors to town with your Margarett Root Brown Reading Series and plays host to Houston’s longest running open mic, the First Friday series. Also featured on this year’s tour are current spoken word hotspots such as Rudyard’s Pub (Thursday August 8th), home of the wonderfully original storytelling series, Bootown Theater’s Grown Up Story Time and Khon’s Wine Darts Coffee Art which hosted the ThoughtCrime Poetry Showcase for 3 years will host our close-out party on the roof on Saturday August 10th. We also try to bring in new establishments that are breaking into the art and literary community like Winston’s on Washington (Wednesday August 7th), and Boomtown Coffee in the Heights (Tuesday August 6th). Historically the tour has reserved one night of the festivities to highlight a prominent community center and this year is no different; we’re honored to be presenting at Talento Bilingüe de Houston on Friday August 9th. As has become tradition, the WAT Tour will kick off at Bohemeo’s Art House in the Second Ward at 8 pm sharp on Sunday August 4th. Inprint: Is there anything new this year or something people should keep an eye out for? Inprint: What’s your most memorable experience from last year’s tour? Stephen: As an organizer, the experience is different from when you’re performing in the line-up, or you’re a featured Veteran, or as an audience member who just came to see the show. The point of the tour is to introduce audiences to poets and poets to new audiences and venues. To do that you have to have the support of both the venues and the audiences. My most memorable experience from last year’s tour had to be when we were at the Baker Ripley Neighborhood Center on Friday night. We had had record-breaking crowds every night of the week. On opening night we had so many people at Bohemeo’s that the crowd literally spilled out into the parking lot. By Friday we had come to expect this sort of reception, and when my headcount only turned up 48 people in the auditorium at Baker Ripley I was in a funk about it. One of the poets on the tour, the Fluentone, put the whole thing in perspective for me when he said, “Stephen, you brought out 50 people to a poetry reading outside the loop on a Friday night, I’d say that’s pretty good”. That’s when everything clicked for me and as an organizer I was finally able to relax. One of the poets on the tour, the Fluentone, put the whole thing in perspective for me when he said, “Stephen, you brought out 50 people to a poetry reading outside the loop on a Friday night, I’d say that’s pretty good”. That’s when everything clicked for me and as an organizer I was finally able to relax. It was working, people were responding, and last year’s tour turned out to be our most successful yet. All of the hard work and the gradual building from year to year is paying off. It makes me excited for this year. Inprint: Mark your calendars and get ready for a great week of poetry readings. For more information on WAT and details on the readings visit wordaroundtown.org. I’m a year in Houston, and finally may be able to partake of what Houston has to offer for a writer, poet and storyteller…. And finding a reliable source of information about what is going on, where one can find Open Mics (Then I have to hope I don’t work that night! ), and more is a lost cause. What happened to the grand purpose y’all set up for this blog? Krupa Parikh is Inprint's Communications & Community Relations Director. She reads too much fiction and likes to pretend that she lives in New York City, but secretly we all know she loves Houston.